Lately my husband and I have been on a "salads for dinner" kick, perhaps because summer is on its way and we'd like to fit back into our lighter clothes! This salad is a full meal (and makes a great potluck or picnic dish) with a variety of nutrients, textures and flavours. And it's highly versatile -- use any root vegetable and green bean you like! Scrub the parsnips clean and trim off the ends plus any hard bits of skin. Chop into grape-sized pieces and steam until tender, about 20 minutes. Meanwhile, wash snap peas and trim off the ends. Chop in half. Steam until tender-crisp, about 5 minutes. Lightly salt the steamed vegetables and allow to cool. Wash, dry and tear enough lettuce and spinach to cover dinner plates generously. Wash and halve the cherry tomatoes. 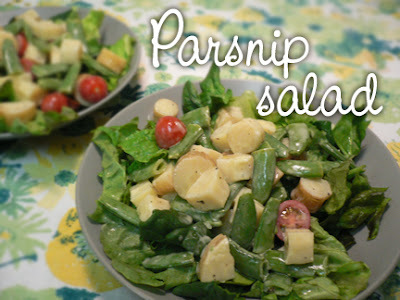 In a large bowl combine all the dressing ingredients; taste and adjust seasonings (more pepper or olive oil? ), then add steamed vegetables and tomatoes and toss to coat evenly. Spoon over the greens and you're done! Serves 2 for dinner, or 4 as a side dish. For extra healthy ingredients, substitute 1 Tbsp olive oil for 1 Tbsp flax or hemp seed oil, and/or add 1 small cubed avocado.